The World Federation of Diamond Bourses (WDFB) was founded in 1947 as a body that would unite diamond exchanges under one roof. It was created to provide a common set of trading practices for bourses trading in rough and polished diamonds, as well as colored stones. It is composed of 30 member diamond bourses with their headquarter in Antwerp. Members of the WFDB act as a medium for the wholesale diamond exchange. 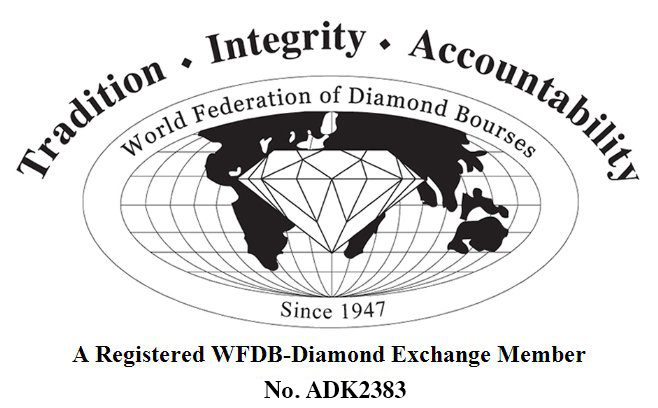 The WFDB Mark is a trademarked logo, which approved members of World Federation of Diamond Bourse - affiliated diamond exchanges can display to clients and suppliers, to confirm that they abide by the World Federation Code of Principles. A bourse member may present the WFDB Mark as long as he or she is in good standing. The WFDB Mark symbol is based on the WFDB logo. It features text and registration number that indicates it belongs to a registered WFDB bourse member. It also includes a brief slogan, listing the three elements that members of the jewelry trade should be reminded of when they see the WFDB Mark: Tradition, Integrity, and Accountability. The World Federation’s Code of Principles (WFCOP), is a set of better business principles to which members of WFDB bourses who display the WFDB Mark are committed. The WFCOP is made up of a preamble, which describes the ethical and moral obligations of a WFDB member, and an appendix which lists the relevant resolutions passed by the organization. Issues addressed include HPHT treatments, conflict diamonds, synthetic diamonds, child labor, health conditions in the workplace, disclosure and non-disclosure, fracture filling, laser drilling, and the removal of laser inscriptions from a girdle. While many organizations have introduced sets of Best Business Principles, almost none have managed the more difficult task of creating systems for auditing, monitoring, and enforcement. The WFDB has had such a system in operation for years. Every one of its affiliated bourses has a judicial system in place, and decisions taken at one bourse can be enforced in all of its sister bourses. Riginov's CEO & Founder Mr. Napoleon R. is since 2014 a member of the Antwerpsche Diamantkring diamond bourse. Established in 1928 in Antwerp Belgium, it became the first diamond bourse worldwide that is dedicated exclusively to rough diamonds trade. 85% of the world’s diamond supply is traded in Antwerp, and in particular in the Antwerpsche Diamantkring.